The original house at Drenagh was known as Fruithill, and was built over 300 years ago by Robert McCausland. 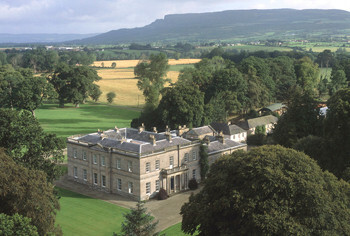 In the early 19th century the famous Irish architect Sir Charles Lanyon, was commissioned by Marcus McCausland to design and build the great neo-classical Georgian house that we see now. Today, Robert McCausland’s direct descendant, Conolly McCausland, lives at Drenagh with his wife and children. The main house accommodates up to 24 guests, with room for a further 6 guests in the Dower House, an elegant Regency Manor House within the estate. In the bedrooms there are four-poster beds and in the bathrooms, claw-foot baths. Large windows open onto unsurpassed views of the Donegal hills and Sperrin Mountains. The main reception rooms downstairs offer a magnificent and relaxed setting for anything from tea parties or a quiet dinner à deux to conferences and formal banquets. From any of the rooms, glimpses of Drenagh’s lush gardens can be caught over soft green lawns. The Main Hall has capacity for 70 people seated; the Morning Room for 60; the Billiard Room for 40 and the Salon for 25. One or more rooms can be used as required. The Dining Room will hold 50 for a formal dinner or wedding breakfast and offers a fabulously opulent setting to suit any variety of corporate or private events. Guests will be served the best of fresh local produce, from a wide range of award-winning food producers. Top quality wines are also available. Drenagh has its own private cricket ground, while fishing and riding can also be arranged, either on the estate or nearby. Access to local world class golf courses, including Royal Portrush, as well as wonderful sandy beaches are within easy driving distance. It would be difficult to find a more perfect place to enjoy a special birthday weekend or to entertain VIP business clients. Drenagh is situated a short distance from the historic City of Derry, near the old market town of Limavady. This magical 1000 acre estate lies in the shadow of the great cliffs of Binevenagh Mountain and the Mussenden Temple, both landmarks on our dramatic North Atlantic coastline. For visitors who are flying in by passenger or private jet, Drenagh is only 8 miles from City of Derry Airport. A limousine or helicopter service is on hand to transfer guests from City of Derry, Belfast International or Dublin Airports - directly to the Estate. Proximity to the beautiful landscapes of Co. Donegal. Drenagh is situated in the North West of Ireland, near the old market town of Limavady and the historic City of Derry.